crowded with incident played out in Essex and Kent, the 'Catswolds' and Cambridge, as Nimrod moved house with his 'Obliger' Peter Newman Brooks. It is the record of a rare nine-life experience embracing not only the usual routines pet lovers enjoy, but also many a crisis verging on disaster. Endearing to the end, Nimrod would not have wanted a halo; but he surely strained every sinew to surprise all who knew him as a great character, independent, and shrewd - a cat of many parts! "Because of his fondness for felines, I, NIMROD, have allowed my Obliger, the Author, to write this biography. My full life has been demanding and left few spare moments for me to set about such a time- consuming task. In any case, writing about oneself can be boring, so the very thought of an autobiography I ruled out long ago. Yet when in repose, curled up with a paw over my eyes in many a favourite spot and Summer sleeping place, I have often pondered the matter. And my considered opinion has brought me to a compromise I hope readers will find acceptable. Almost all my lives I have trusted to my Obliger, and his very cattitude therefore makes him well qualified to write about them. But that will not prevent my including partial memoirs here and there - with my monogram upon them." This is perfect bound paperback, written by Peter Newman Brooks, 184 pages long, with 14 beautiful illustrations by Ian Levene and three photographs. The book is published by Milton Contact Limited in cooperation with Moyhill Publishing. The RRP is £8.50, ISBN: 190559710X. Believe it or not, my Mother was what Americans call a Calico cat! ...always keep on your pads for instant action! Never mind that most humans tend to despise felines for precisely such foresight, even though others have come to realize that, without our dutiful care, rodents would overrun the world. ... as a whole, the community frowned on cat burglars, and once local worthies - the Women's Institute in committee, and regulars who propped up the Inn's Public Bar - began to compare notes, even cursory stocktaking revealed a rise in petty theft. Briefly, Coln was convinced that cat crime had risen, was rising, and had to be diminished. ...by now a seasoned traveller…en route for Cambridge he provided good company. Never lost for words, with many a mew to the driver, he gave a full running commentary on the journey. Challenged in the gloom, Peter was asked to explain himself. "I'm here to collect my pet", he replied, "a cat currently fouling consecrated ground!" A tale of the unexpected, the incident received prominence the Cambridge Evening News. The higher he went too, the better the view. Why restrict Cambridge 'Night Climbing' to the student world? He'd heard his human friends boast of roof-top skills - and even learnt of unknown heroes who, unseen, had once assembled a car on top of the Senate House. ... for me it was another life lost. The little green space of that down-town cemetery had become a happy hunting range; and St Botolph's churchyard wall my parade ground. I had got to know both well; yet almost overnight I became a displaced puss-cat and was taken to Downing. What scope North Farm offered the whole family; and nobody was more excited by the Landbeach move than Master Nimrod. So recently honoured with a proper name, his singular status as a Siamese prince now promoted him to be a country squire. For here was a residence comparable in every way to what he had enjoyed in the 'Catswolds', or for that matter even to his birthplace in those far-off Essex days. What a relief it was to discover Corgis that took to a cat as much as he warmed to them! Any frosty behaviour thawed out within five minutes of their reunion, and when the dogs were walked, Nimrod pranced along behind, round the paddock and even across the fields in the open country beyond. The bird did not attack, but staged a fly-past and spectacular swoop. And that was enough for, bewildered by the owl's last-second swerve, a hissing Nimrod leapt from the beam to avoid collision, and clung to a weather-board on the garden side of the barn. It had been a near miss, and in shock the frightened cat forced his way through a broken panel to survive in fresh air. Nor am I colour blind - just fascinated by owls. In the 'Catswolds', Grey Cat had taught me to respect them, but never pointed one out, fur to feather so to say. No small wonder that I found myself mesmerized by that staring white ghost in the barn! Humans may moan about Parrots - but their mimicry cannot compare with the tiresome way Starlings annoy cats, and Nimrod determined to lodge a Siamese protest. I've been given to understand that complete disaster nearly came my way and I'm lucky to survive. 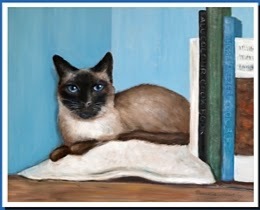 Be that as it may, we cats have a relaxed outlook, and I want readers to know that all Siamese look on the bright side of life! Nimrod knew well that even the best cooks valued encouragement from those they served with long hours of selfless devotion in the kitchen. There were, moreover, ample rewards on hand for a cat prepared to mew a running commentary on recipes, and be ready to sample and taste acceptable ingredients, or any kind of fare a cook's generosity might hand down. Altogether unnerved, a spitting, swearing Nimrod took up the challenge at once. Without as much as a pause to tiptoe around or ponder tactics in a battle plan, his claws shot out and gripped the brown body in a tight vice. Then, with a swift lunge of his jaw, the cat neatly nipped the foe with a well-placed blow at the back of the neck. Precise timing and fine physique had triumphed - the rat's body relaxed, slumped forward, and after a brief sequence of terminal shivers, lay still on the ground. After a professional career as a Cambridge don - well known for writings on the reformations of the sixteenth century – PETER NEWMAN BROOKS has turned to natural history. Flora and fauna he has long found inspirational, and this memoir is not only a tribute to his much-loved cat NIMROD, but also to wildlife in general. At Robinson College, Cambridge – of which he is now Life Fellow – Dr Brooks came to know the illustrator IAN LEVENE, an artist of distinction, and another cat lover.